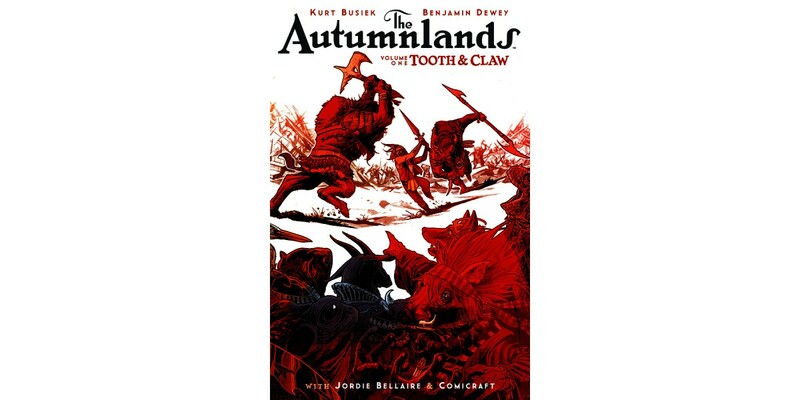 Writer Kurt Busiek (ASTRO CITY, Marvels) and artist Benjamin Dewey (Tragedy Series, Star Wars) build a vibrant, layered fantasy series in THE AUTUMNLANDS: TOOTH & CLAW. The first six issues of the series will be collected into a trade paperback and available this June. THE AUTUMNLANDS: TOOTH & CLAW, VOL. 1 is Conan meets Game of Thrones with a splash of Kamandi. An original high-fantasy epic for mature readers, THE AUTUMNLANDS begins with a secret conclave of wizards as they summon a legendary champion back through time in an effort to save the world. But instead, their efforts are met with disastrous consequences. THE AUTUMNLANDS: TOOTH & CLAW, VOL. 1 (ISBN: 978-1-63215-277-0) hits comic book stores on July 1 and bookstores on July 14, and will be available for $9.99. It can be ordered by retailers from Diamond Book Distributors with Diamond Code APR150573.